It is essential that children’s vulnerable ears are optimally protected from excess ambient noise. Pluggies Kids earplugs are suitable for children in the age group of three – twelve years. It is essential that children’s vulnerable ears are optimally protected from excess ambient noise. Pluggies Kids earplugs have been specifically designed to dampen loud noise and music. The soft, comfortable earplugs are durable and can be used for various purposes. 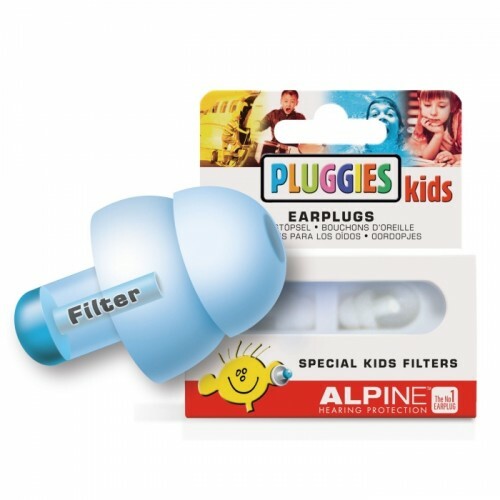 Pluggies Kids earplugs are suitable for children in the age group of three – twelve years. For instance, against loud music, in the cinema and in other areas where children are confronted with too much noise. Many children have trouble concentrating at school, while making their homework or when reading a book. Research has shown that wearing Pluggies Kids strongly improves their concentration. On board of an airplane, many children experience earache caused by a difference in pressure during take-off and landing. Pluggies Kids reduce the difference in pressure and allow the child to sleep comfortably. Children often suffer from earache and ear infections. Pluggies Kids help you to prevent water from getting in their ears when swimming, showering, practicing water sports and taking a bath. The Pluggies Kids earplugs mute the sound of firecrackers and high pitches of fireworks. Pluggies Kids earplugs are made from durable, soft material and are very comfortable. Pluggies Kids earplugs have special dampening filters, which ensure that noise is maximally blocked-out, leaving the child with enough hearing capacity to still hear sounds in his surroundings. Therefore, the child does not feel closed off. Dampening values measured by TNO in accordance with EN 352-2 (2002) standards and calculated in accordance with ISO-4869-2a standards.